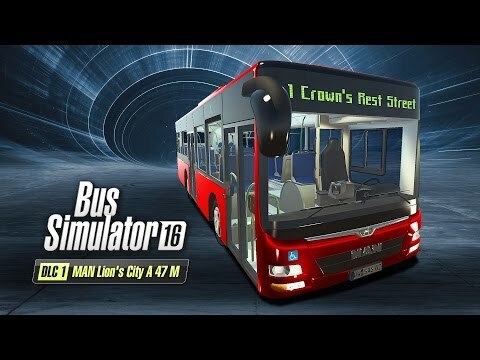 Buy Bus Simulator 16 - MAN Lion´s City A47 M (DLC1) and get the games download now! So you want even more content for your Bus Simulator 16? If so, then the first expansion pack is perfect for you. Try out the MAN Lion’s City A47 M. This bus is 10.5 meters in length and has two doors, and will enable you to navigate inner-city traffic at rush hour with ease and agility. This premium bus model licensed by MAN has a rear door equipped with a ramp and can seat up to 29 passengers. We hope you enjoy this compact little bus! For the creative types among you, we have three very special decals as well as three colorful advertizing banners. Stick them on your buses and win the hearts of your passengers. Is life as a bus driver is dreary without music? Of course! That is why this expansion pack contains 3 new tracks that you can play on your bus radio. You need the main game in order to play the first expansion pack for Bus Simulator 16. You do not have to puchase the expansion in order to continue playing with your friends in multiplayer mode. However, you can only use the new content if you have the expansion.